Obsidian chief Feargus Urquhart says the studio is definitely putting its stamp on the upcoming Fallout: New Vegas but warns that gamers expecting some sort of Van Buren rebirth are in for a disappointment. 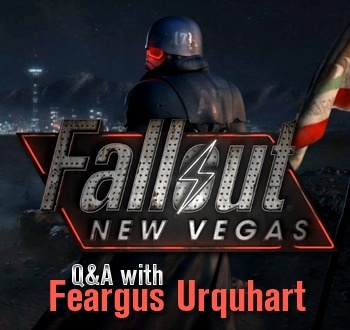 Urquahart, of course, was the man at the head of Black Isle Studios when it created the famed Fallout 2. Its planned version of Fallout 3, known to fans by the code name Van Buren, never saw the light of day, however, as the game and the studio alike fell victim to Interplay's millennial death spiral. Now he's back for a second try at the head of Obsidian Entertainment, but the time for Van Buren, he told The Escapist, has passed. "A lot of it is that it's not the Black Isle team, it's people from the Black Isle team working on it. It's a different set, it's a different group of designers. I've learned a lot, Josh [Sawyer, Lead Designer] has learned a lot about making games since then," he said. "Back then, we were trying to steer away from something like Vegas. We just had Reno in Fallout 2. It's something that would have been a difference if the other game had come to fruition." But he promised that the Obsidian "vibe" will still come through when gamers get to New Vegas. "Every studio has a different approach to things, a different vibe. When it comes to us, Fallout is always a little campy," he said. "We probably play that up a bit more - like with Dinky. Like you were saying, it's the Vegas thing. People are going to take that away. They're just going to have a different vibe playing it." "If you take someone who played New Vegas, and didn't play Fallout 3, and someone who played Fallout 3 and didn't play New Vegas, and they talked about the general feeling of playing it, they would say very different [things]," he continued. "'Oh, it's kind of a wasteland - it was very desaturated,' and then the New Vegas player would say 'Oh, no it was blue skies, and there's a dinosaur,' and things like that." Urquhart touched on a number of other topics as well, including the challenges in moving from an isometric to a 3-D game design, the potential for conflict between Obsidian and Bethesda and the very practical reasons for including a giant dinosaur named Dinky in the game. Check out his full interview with Russ Pitts of The Escapist at Feargus Urquhart Comes Home.